The site of the former Andersonstown RUC barracks in west Belfast has been renamed Groves Reilly Corner, in honour of Clara Reilly and her late friend, plastic bullet victim Emma Groves. Relatives for Justice chairwoman Ms Reilly (pictured, centre) established the first monitoring organisation of human rights breaches by the Crown Forces during the late 1960s and 1970s. She said: “Anybody deserves justice if they lost a loved one and they have not gotten the truth and answers - that is all they want. Ms Groves was blinded by a Crown Force plastic bullet in 1971. She and Ms Reilly founded the United Campaign Against Plastic Bullets, which was responsible for taking giant strides towards an outright ban on the lethal projectiles. Andersonstown was itself the location where one victim, John Downes, was killed by the RUC with a plastic bullet in 1984. The married mother of six recounted how she lived in Turf Lodge in West Belfast in 1969 and was the only person with a phone. They formed the Association for Legal Justice in 1971. She said Emma Groves was standing in her own living room when a soldier fired a rubber bullet through the window and she was blinded. Ms Groves went on to lead the campaign against their use. Paul O’Connor from the Pat Finucane Centre described Emma Groves and Clara Reilly as “two lives of resistance”. “Two women who were leaders in their community - and Clara still is,” said Paul. “Many communities would be lucky to have had one of these indomitable fighters. Belfast and beyond had two but for the saddest of reasons. We say that Emma was ‘blinded by a rubber bullet’ in November 1972 but she was actually blinded by a British soldier, a Para, who deliberately fired a rubber bullet at her face. “There wasn’t even an allegation that she was a phantom gunwoman or nail bomber. She simply refused to turn off the rebel songs she was playing in her own home. 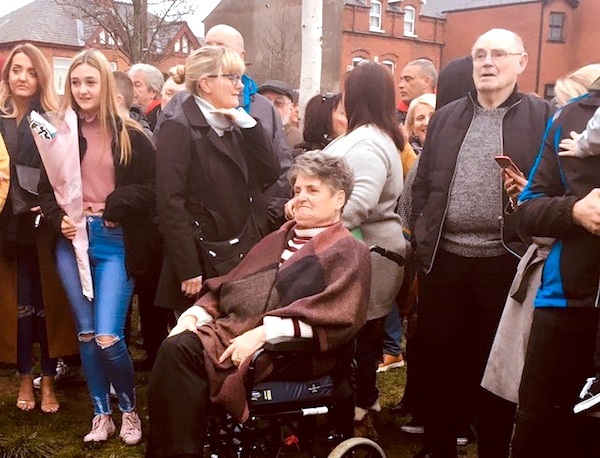 At some level the British Government must have regretted that day because Emma Groves went on to campaign, highlight, expose, denounce and bear witness to the dangers posed by rubber and plastic bullets in the following decades. “It is totally appropriate that the site of the former Andersonstown RUC barracks, scene of so many pickets with Emma and Clara, should now be renamed to honour these two strong working class women who did so much for others.